2012 Chapter and Verse section by RUC Alex Monteith 4by3 from Alex Monteith on Vimeo. The footage was originally shot on 16mmfilm as part of Chapter and Verse, Alex Monteith, 90min, 2005. 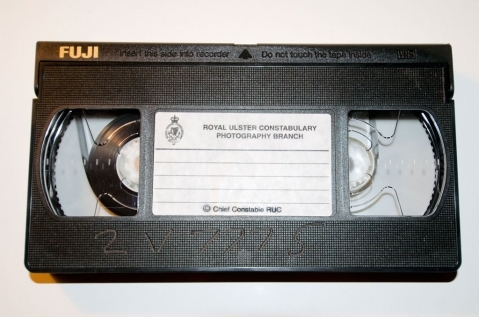 The 16mm film canister was confiscated from Alex Monteith in Strabane by the then R.U.C (now Police Service of Northern Ireland) immediately following the shot of the blue and white R.U.C land rover, 11th July 2001. A plain clothed police woman was injured when the rear window of the blue sedan was smashed in. The R.U.C. had the 16mm film processed and transferred to VHS. Alex Monteith worked through Castlederg (Co. Tyrone) politicians to have the footage returned for Chapter and Verse. The 16mm can, plus a VHS dupe were returned in November 2001. The artwork consists of the VHS dupe supplied by the R.U.C. of the 16mm. Mangere Arts Centre - Ngā Tohu o Uenuku, Takami Makaurau, Aotearoa, Globalising Wall, Nov 2012 - Feb 2013, curated by James Pinker includes work by Danae Stratou Alex Monteith and Shahriar Asdollah-Zadeh.